Two decades after Turner Field opened to welcome the Atlanta Braves — following a successful stint as Centennial Olympic Stadium during the 1996 Summer Olympic and Paralympic Games — the famed venue will close this chapter in its short history as the Braves embark on the next chapter of theirs at SunTrust Park. Located 15 miles away in Cobb County, SunTrust Park will be the Braves’ third home in their 51-year history. As Turner Field is converted into a football stadium for Georgia State University, SunTrust Park — under construction since 2014 — is in the final countdown to Opening Day 2017. BravesVision, the team responsible for creating all team video content — including the game-day presentation on the main video display, which has the same name — is up for the challenge. 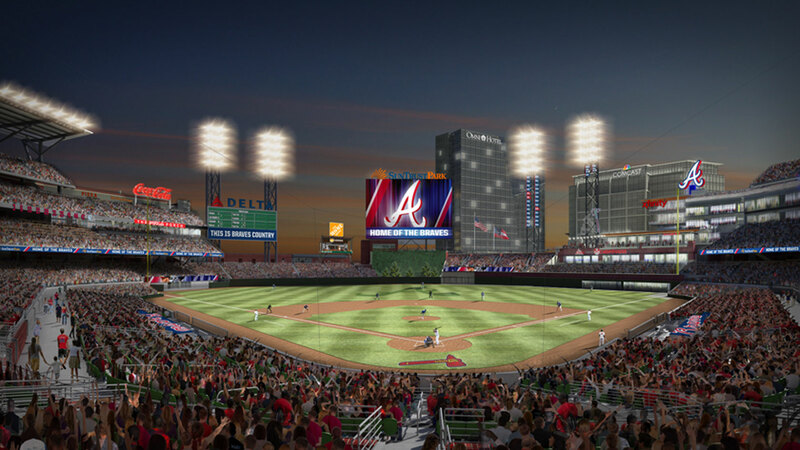 Earlier this month, the Braves announced that Panasonic Enterprise Solutions will design and install the SunTrust Park’s primary BravesVision videoboard, as well as a wealth of other LED displays throughout the stadium. BravesVision, located in center field, measures approximately 64 ft. tall by 121 ft. wide and features 16-mm resolution. The team added five Grass Valley LDX 86 hard cameras, four positioned under the videoboard and facing out at the crowd; the fifth LDX hard camera will be positioned at high home. Rather than position the cameras in traditional broadcast locations, the Braves plan to rely on the home broadcast feed for game coverage and use their own cameras to capture fan reaction, crowd shots, and more. Two additional wireless cameras will roam the stadium and provide extra coverage as needed. From now until March 31, when the Braves open SunTrust with a preseason game against the New York Yankees, Panasonic will install approximately 30 LED displays around the stadium with resolutions ranging from the 16-mm BravesVision display to a 6-mm display in the stadium’s Xfinity Rooftop in right field. A 90- by 30-ft. out-of-town scoreboard will be installed in left center field, and two LED displays — each measuring 90 by 6 ft. — will be installed above each bullpen in right center field. An 830-ft. LED display will stretch from foul pole to foul pole in three sections along the terrace level: first baseline, home plate, and third baseline. Rounding out the LED signage at SunTrust Park will be a handful of closed-captioning displays, sponsorship signage (including an LED sign in place of the iconic Chik-Fil-A cow’s sandwich board), highway marquees, and plaza displays. The plaza will also feature a giant baseball wrapped in a spherical NanoLumens LED display. To implement their creative vision, the Braves turned to Alpha Video for assistance with vendor and equipment selection. The Braves deliberated going all-in on IP and eventually decided on a hybrid approach. The team, with the help of Alpha Video, chose a Grass Valley hybrid router that can serve the current need to deliver 1080p/60 video throughout the stadium with the option to upgrade in the future as IP-based technologies become more commonplace. It’s no secret that fans have come to expect an in-venue videoboard show that replicates the at-home broadcast experience. And, while the Braves have certainly accomplished that with BravesVision, the team has a number of other fan-engagement elements up its sleeve. According to Cunningham, the team is particularly excited about its Cisco IPTV system, which will keep fans informed and engaged with the game no matter where they are in the stadium; its LED light system, which will be incorporated into the overall game presentation; and its WJHW-designed audio system, which will give the team the ability to play with stereo effects, chase effects, and more. 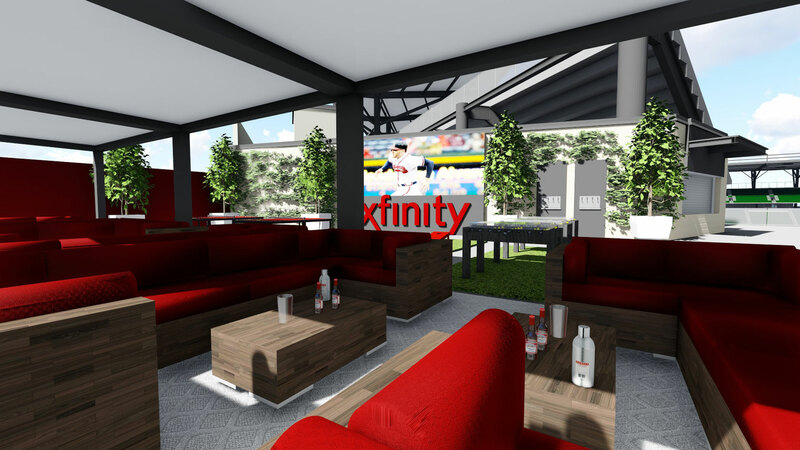 Lastly, up in the Xfinity Rooftop, the Braves have partnered with Georgia Tech and others to experiment with virtual reality and see how fans interact with VR as part of their overall game experience. 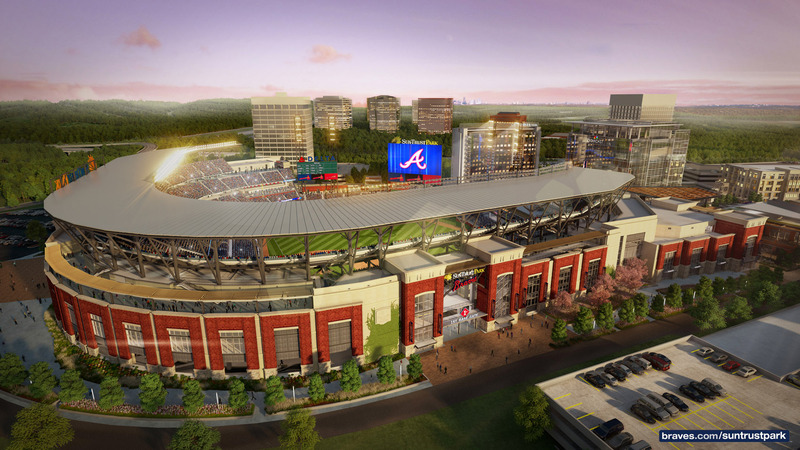 All photo renderings courtesy of the Atlanta Braves.